Delicious dining awaits at these popular Branson restaurants. With more than 300 restaurants, chains, cafes and buffets in Branson, the Midwest’s favorite family vacation destination is full of delicious dining options — but that can make choosing a challenge. Don’t worry. Whether you want a hearty meal before a full day of fun, or a chance to recharge before hitting the town for an evening of entertainment, here are a few recommendations to help you find tasty food and memorable experiences during your stay. 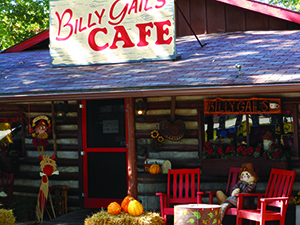 West of Branson you’ll find the humble Billy Gail’s Café (5291 State Highway 265) housed in a hillbilly-chic log cabin. It’s bigger inside than it looks from the outside, with walls decorated in vintage flea market finds that speak to this spot’s homestyle grub. The challenge at Billy Gail’s is to finish the heaping portions of breakfast or lunch. Omelets are made with four eggs and pancakes are bigger than their plates. If you have a hard time making a selection, try the Sloppy Biscuit: a biscuit heaped with cheese, sausage and an egg smothered with country gravy. Make sure you’ve got some cash on hand, if you don’t want to end up washing dishes for the day. Billy Gail’s doesn’t take credit cards. Branson isn’t only about country-fried cooking. You’ll find restaurants offering menus of Japanese, Chinese, Italian, German, Thai, Indian, Cajun, Mexican and Greek cuisine as well. A favorite among Branson locals is the Mediterranean-influenced Vasken’s Deli (next to Branson Mill Craft Village, 3200 Gretna Road). Besides its many salads, pizzas and sandwiches, Vasken’s serves authentic gyros made with rotisserie lamb and beef. The meat is stuffed in a fresh pita with tzaziki sauce and veggies. Appetizer and side dish suggestions include hummus, fafalel with tahini, stuffed grape leaves and tabouli. For dessert, choose from 12 varieties of baklava or other international pastries. If good ole American shakes and burgers are what you’re hungry for, stop in the recently remodeled and repainted Mel’s Hard Luck Diner (Grand Village Shopping Center, 2800 State Highway 76 West). The ‘50s-style menu lists such fun-named items as the Sixteen Tons Chili Burger, Romeo Reuben, Love Me Tender Fried Steak and Build Me Up, Banana Cup (their version of the banana split). The biggest surprise at the diner is its team of servers and other staff who sing while you eat. A couple of American Idol contestants have originated from this group of professional entertainers. Patio and window views of Lake Taneycomo add to the eclectic rustic ambience of Black Oak Grill, open for lunch and dinner (601 Branson Landing Blvd.). Guests can watch the fog roll in at dusk while sipping the restaurant’s signature Black Oak Punch, a combination of Bacardi rum, Asti Spumante, and ginger ale with a splash of cream. A recent addition to the menu is the Seared Ahi Black Oak Salad made with slices of Ahi set on a bed of spring greens and topped with sliced almonds, crumbled bleu cheese, chopped Fuji apples and maple pecan vinaigrette. Other menu items to try are the fried goat cheese, grilled meatloaf and Dino’s 24 Karrot cake (made by American pianist and Branson resident Dino Kartsonakis). Black Oak Grill’s sister restaurant, Cantina Laredo (1001 Branson Landing, on the center plaza), has offers some of the best seats to view the Landing’s famous water and fire show. The gourmet Mexican restaurant offers traditional, made-from scratch fare, starting with its signature margarita, the Casa Rita. House favorites are the Camaron Poblano Asada, a poblano-stuffed steak; Pollo Mango Mole with grilled chicken. Round out your meal with a Mexican Brownie served on a sizzling skillet and the Top Shelf Guacamole, a meal all by itself. In downtown Branson across from the Branson Landing, is the award-winning Level 2 Steakhouse, located at Hilton Branson Convention Center Hotel (200 E Main St.). It’s about the beef at this fine-dining venue. The menu focuses on cuts of 28-day aged, certified Hereford beef, seared quickly in a 1600-degree infrared oven. The result is tender, full-flavored steaks. Patrons can choose from among five steak knives to use with their steak selections. Once diners have visited the restaurant five times, they can join the Cut Club. Their favorite knives will be engraved with their names to be used during future restaurant visits. Just south of Branson off of U.S. Highway 65 is the College of the Ozarks. The small private college is known as “Hard Work U” because its full-time students work assigned jobs on campus to graduate debt-free. Around 120 students interested in hospitality and culinary arts run the award-winning Dobyns Dining Room at the Keeter Center. Many menu items come directly from on-site organic vegetable gardens, a student-operated dairy and the campus mill, which provides flour and ground corn meal. The menu at this casual-yet-elegant dining venue changes seasonally to take advantage of the freshest ingredients. Continuing south of Branson on U.S. Highway 65 about seven miles is the area’s newest development, the Top of the Rock Ozarks Heritage Preserve which opened in 2014. Said to be located at the highest elevation in Taney County, the surrounding Ozarks landscape views are splendid. Johnny Morris, founder of Bass Pro Shops and Big Cedar Lodge, designed the preserve with conservation and sustainability in mind. Top of the Rock includes the Osage Restaurant and the Buffalo Bar, both opened for dinner. The on-site rotisserie there is responsible for the delicious Signature Rotisserie Roasted All Natural Chicken. Arnie’s Barn is the third on-site restaurant, open for both lunch and dinner. It uses its own rotisserie and wood oven to prepare a Southwestern-themed menu. The Worman House at Big Cedar Lodge sports a Sunday brunch with a Table Rock Lake waterfront view. To reach the resort, visitors can take U.S. Highway 65 south about ten miles and then travel west on state Highway 86 about three miles. Or, guests can reach the restaurant by boat thanks to the marina on premises. The brunch’s five buffet stations include pastries, breads, salads, seasonal fruits and vegetables, omelets to order, house-made sausage, carved meats and desserts. The house specialty is Eggs Worman, hot smoked salmon covered with a poached egg and béarnaise sauce. Finally, if you find yourself on U.S. State Highway 65, don’t miss Lambert’s Café. Be warned: Keep your head up as soon as you’re seated. Otherwise, you’re likely to be popped on the side of the head with a softball-size, hot yeasty dinner roll. Lambert’s claims the title “The Only Home of Throwed Rolls,” baking thousands of rolls fresh throughout the day. The café is known for its southern cooking: fried catfish, chicken and dumplings, fried chicken livers, hog jowl and fried bologna. In case the entrees don’t fill you up, the “pass around” sides will. Servers come by with sorghum and honey for the rolls, and never-empty bowls of blacked eye peas, fried okra, fried potatoes and macaroni and tomatoes.